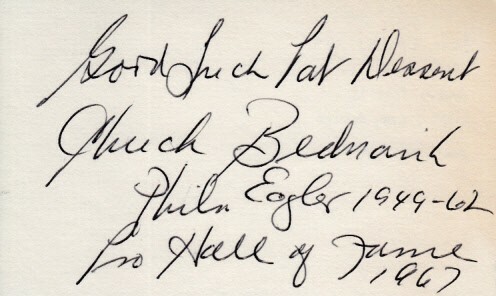 3x5 index card autographed in black ballpoint by the late, great Hall of Famer Chuck Bednarik, personalized Good Luck Pat Dessent and inscribed Phila Eagles 1949-62 Pro Hall of Fame 1967. 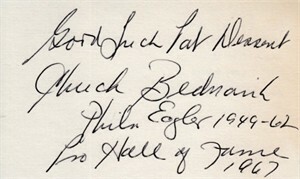 The personalization could be easily matted or trimmed out if framed. With certificate of authenticity from AutographsForSale.com. ONLY ONE AVAILABLE FOR SALE.